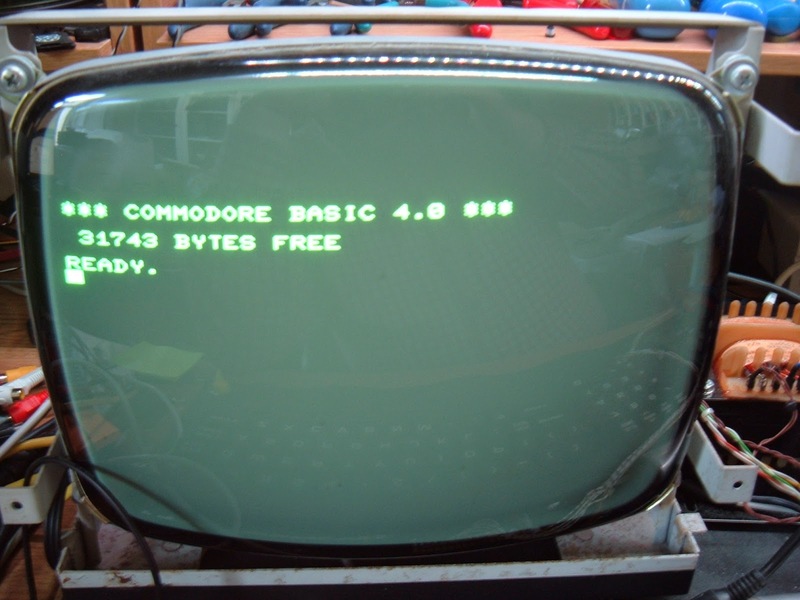 This is the seventh part of the repair and restoration of a Commodore Pet 4032, you might want to start way back at Part 1. 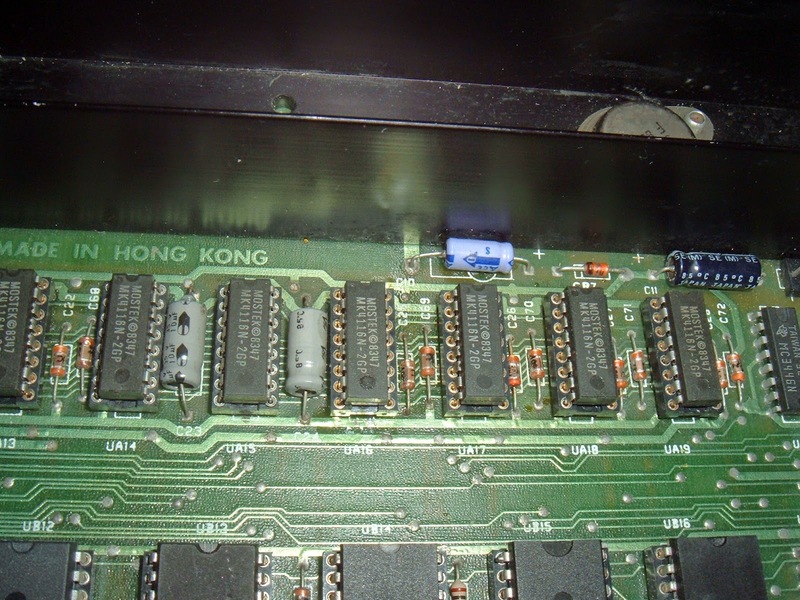 The story so far, the 8032 board has been converted to a 4032 and most of the issues are now fixed, however I am still using the ROM and ROM replacement plug in board to replace the RAM. I now need to fix on the onboard RAM, so it can run on it's own. The PET has 16 x 4116 DRAM chips, providing a total of 32K RAM. 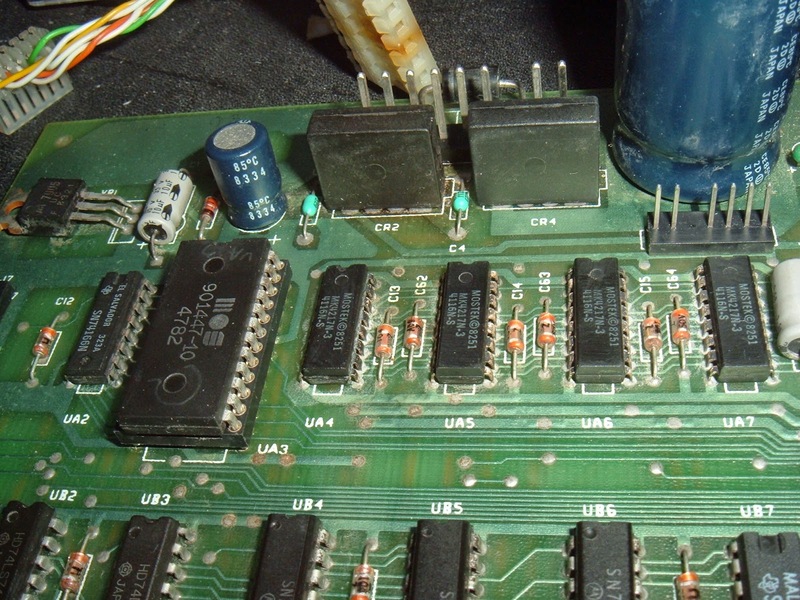 Of these 16 chips, two had been replaced in the past, and the replacements had corroded as the contacts of fetching red sockets went rusty. Some of the others were corroded, and there was some damage to the tracks below those two replacement sockets. I initially replaced the sockets and the damaged DRAM and I tried to power on without the ROM/RAM board. 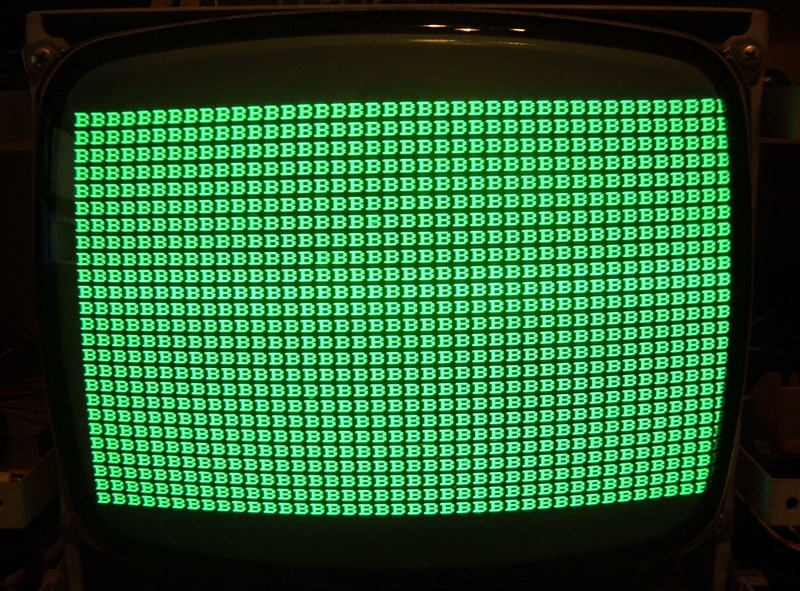 But got only a blank screen, or rather a bright green dot as the CRTC had not been initialised. So the system wasn't running. Returning the ROM/RAM board, and switching to the test ROM on there, I could see all 'G' for good on the ROM/RAM board RAM and when I switched that off, all 'B' for bad for the onboard RAM. It's only testing the first 1000 bytes of RAM (40x25), but that's all it should need to boot, and the result is fairly clear. 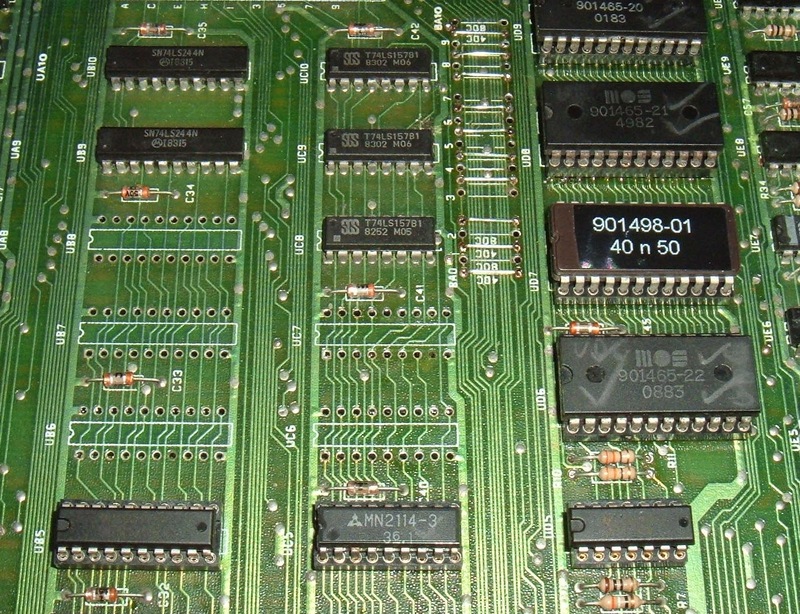 The original Pet's used static RAM, 6550 and then 2114 chips, with 2 chips per 1K of RAM. This means you could remove all but two RAM chips and get it running. Not so for 'dynamic' Pets such as the 4032 here. It uses 8x 4116 chips per 16K RAM, so you need at least 8 working chips to boot. The way the Pet is organised, these alternate, so the lower 16K is UA5, UA7, UA9 up to UA19, and the upper bank is UA4, UA8, UA10 up to UA18. Checking the signals on these chips, it appeared the RAS0 line wasn't being set, and that was tracked to a flip flop, UE1. 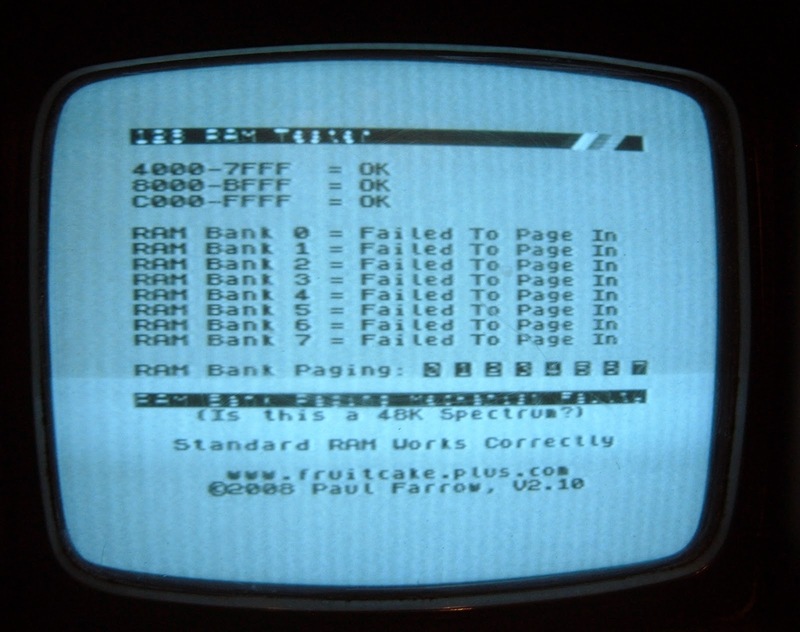 That turned out to be a faulty 74LS74, with that replaced, RAS0 was now correct, but it still failed the RAM test. So all the right signals were getting there, must be the RAM chips. Some of the chips were running hot, so I removed and replaced those, and still nothing. I removed another couple of chips to test a sample of those remaining. 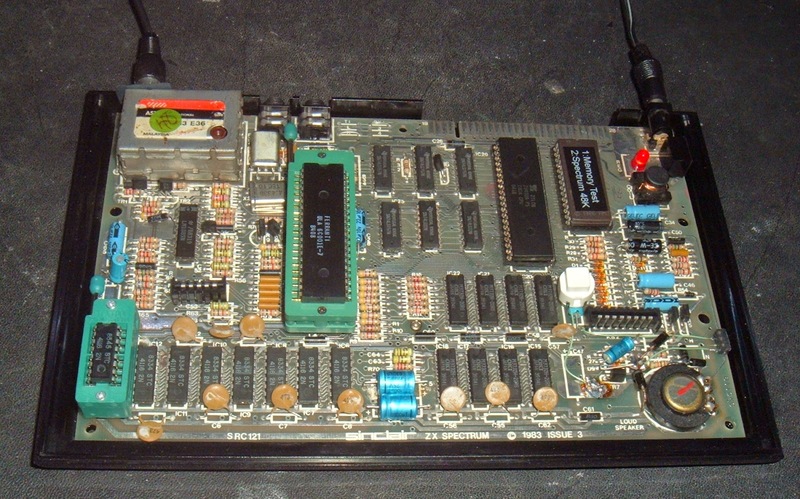 This is my 4116 tester, it's a beat up ZX Spectrum board with a socket on one of the DRAM chips. The board was fried when I got it, the ULA, CPU and ROM were all dead and surprisingly only one of the RAM chips. 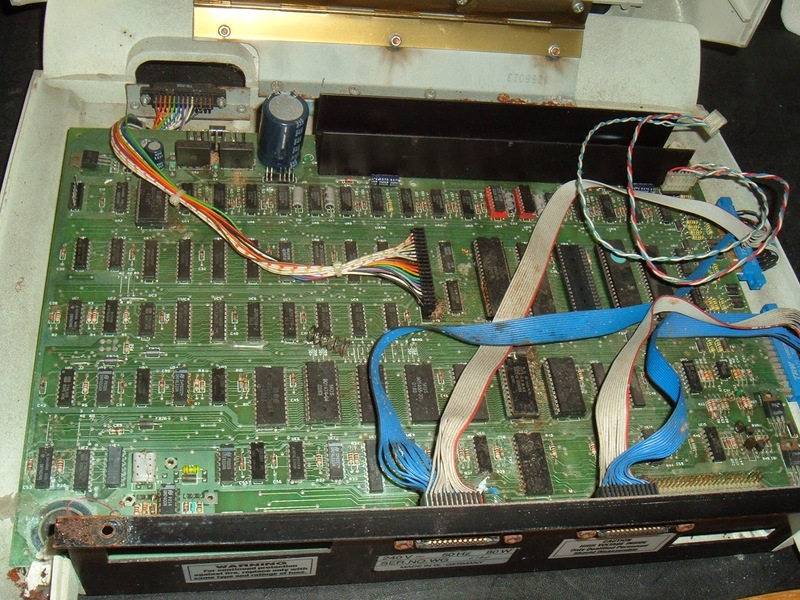 The damaged chips were all socketed and replaced, and it became a spare board, and later I used that it to test a ULA and later again some 4116s. I decided it may be useful for to use as a test platform so add a ZIF socket for those. The 7805 has been replaced with a small switch mode module to improve access (and reliability, and reduce heat etc.). It also leaves a hole where I fitted a red LED to indicate power on. 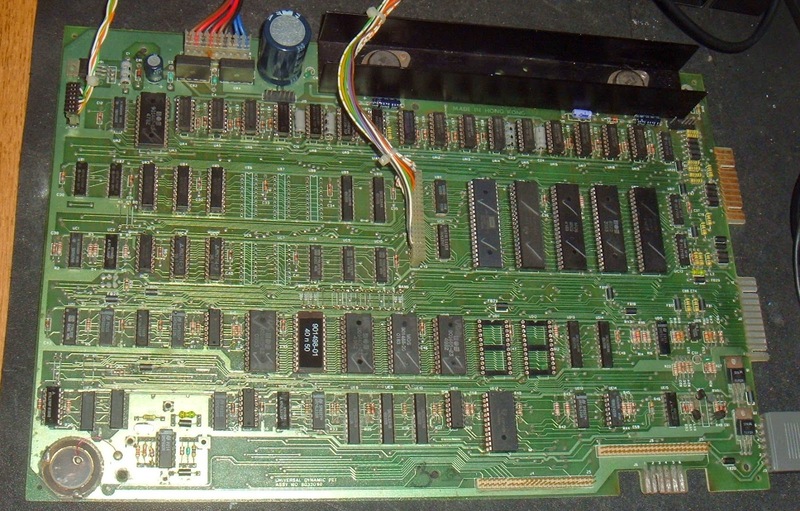 I think this board came from a Spectrum plus, the ugly blob of solder on the right is where the original reset switch was connected, the white switch is now reset. 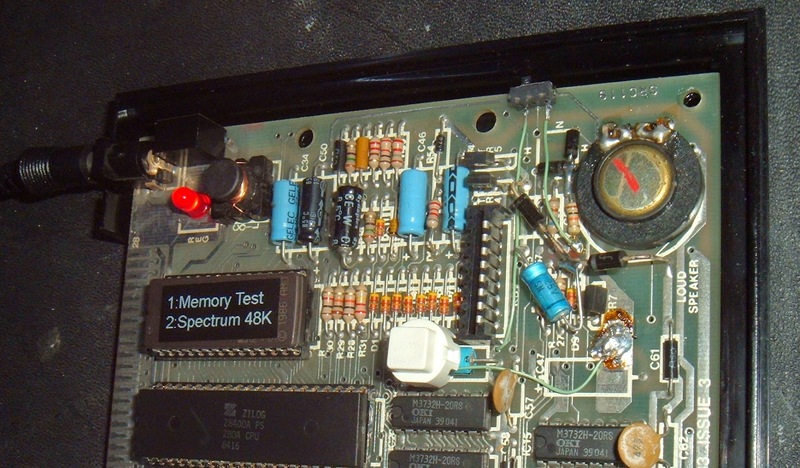 A switch at the side changes between the normal Spectrum ROM, and a RAM test ROM. 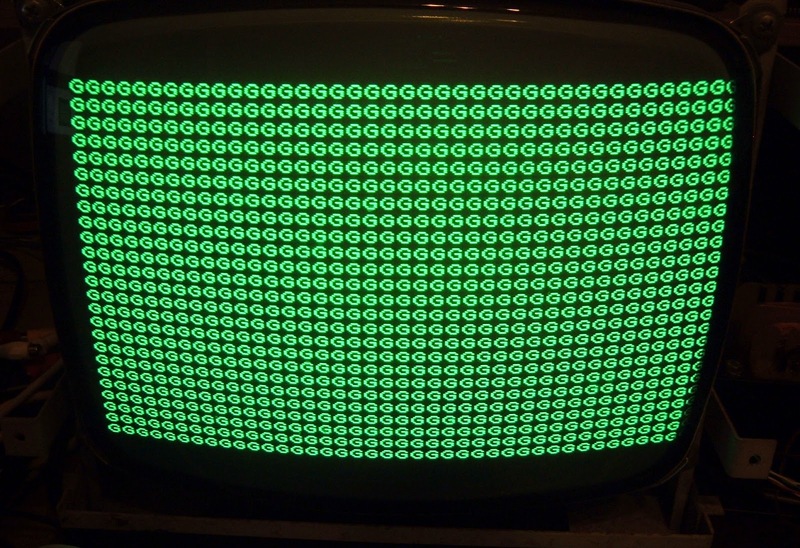 It's actually one for testing 128K Spectrums from Paul Farrow. 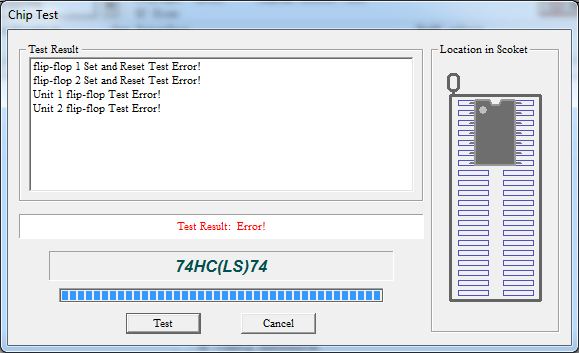 The higher RAM tests fail, but the lower 16K test is still useful. The Spectrum uses 8 x 4116 as 16K of lower RAM and screen RAM, so if this RAM is not working, you get garbage on the screen. 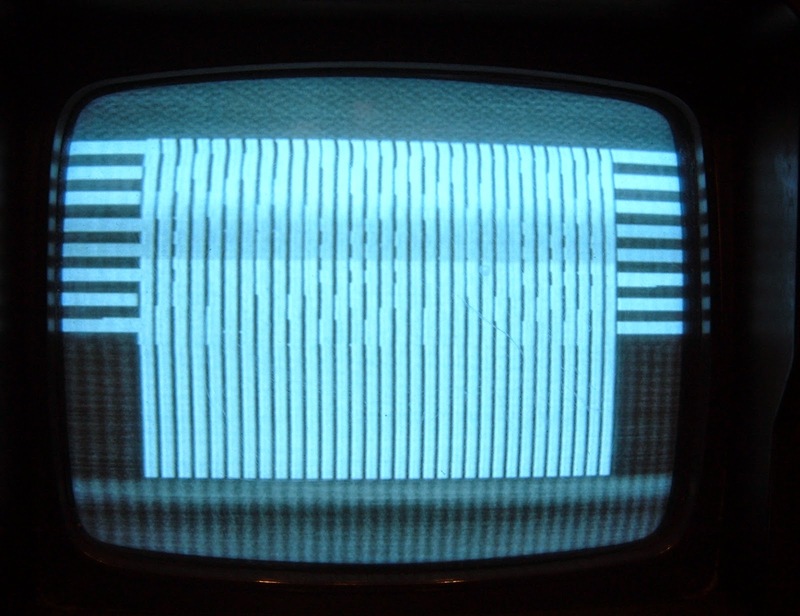 The test ROM sets lines on the border. Here 8 lines mean bit D7, which is the one in the socket. It may not be an exhaustive test of the lower RAM, but it's good enough to weed out the duds. One of the two chips I removed passed the test, the other failed, so I removed the rest to test them all. Out of the 16 chips, two had been replaced already, and the replacements both failed. Two were corroded too badly to test. Two ran hot, so I assumed they had failed. I don't usually test those as if they bring down one of the three supply rails the 4116 needs to run, it could damage the other chips. That left 10. Two of those failed the test. The other 8 were OK. 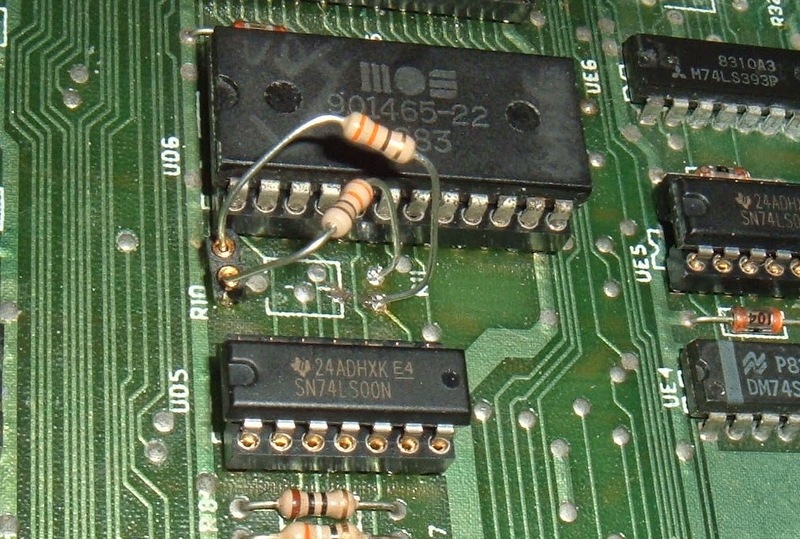 These chips, along with a number of the other logic chips on the board had unusually short pins. These pins don't stick very far out of the board, which makes them difficult to desolder, and they don't sit will in sockets. 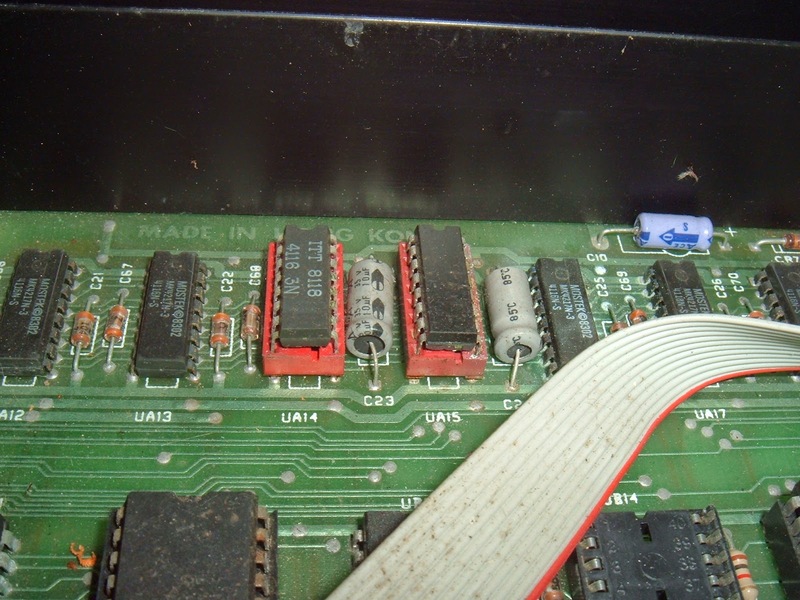 In the end, I put those aside and used 16 known working chips, some MOSTEK branded ones seemed appropriate as that was what was originally fitted. With those in, I still got nothing. An old trick for testing these is to switch the banks around. Both are wired in parallel bar pin 15. 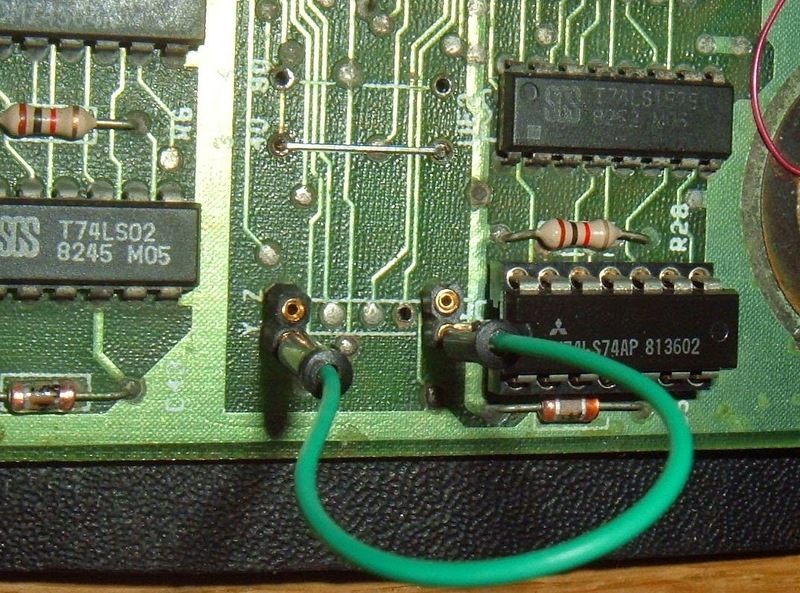 All the upper RAM chips have this wired to CAS1 via R11, and the lower chips have pin 15 wired to CAS0 via R10. (By lower RAM, I mean bank 0, 0x0000 - 0x3FFF, not the chips with the shorter legs). Swapping the connections makes the upper bank the lower one, and vice versa. I temporarily added new resistors with long legs and sockets so I could swap them around. The Y and Z jumpers can be used to change the RAM size, Z is 32K, Y is 16K, with the upper bank disabled. This allows the two banks to be tested separately. I got nothing with the lower bank, but when I swapped them, the upper bank appeared to be working. That's better all G's. 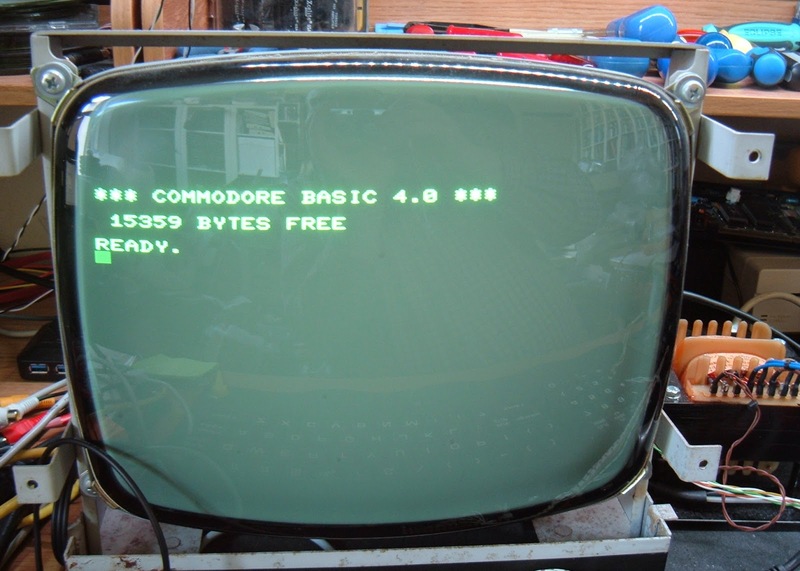 I gave it a go and it booted up in 16K mode. That was good to see, so we are getting there. In order to check it wasn't the RAM chips, I swapped the chips between the two banks, but still the upper one worked and the lower failed. I eventually tracked this down to a broken connection under UA15, where one of the red sockets had been. With that fixed, both banks were working again. I still had them swapped, so I reinstated the two resistors and the link, and finally removed the ROM/RAM board and installed a 6502. I now have a working 4032. 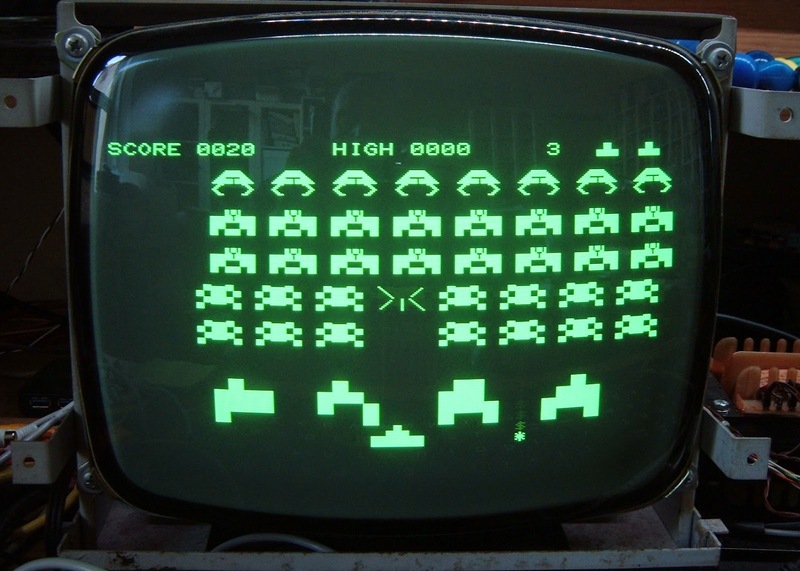 It seems compulsory at this stage to test with space invaders, and all seems well. It doesn't come out that well with my photography, but the screen is really crisp and clear, and a simple game like this looks great. Whilst running that for a while, I noticed one of the 373 latches, UB8 was getting hot. This is one that isn't required in 40 column mode, so shouldn't be active. It wouldn't have been fitted on the 4032 models, so I took the opportunity at this stage to have a bit of a tidy up and removed the five chips (UB6-8, UC6-7) that wouldn't be fitted and made the 4032 mod permanent. It seems to have taken quite a while to go from this.. But it's finally sorted. Now this needs to be put into the case, but first I think the keyboard needs a bit of a clean.